Perhaps the most highly charged case of the 2013 term began life as a series of modified “corporate personhood” jokes. Does the post–Citizens United notion of corporate personhood include the right of a corporation to have and practice a religious faith? Can a craft store go to church? Where does it park? Does it quilt its own hat? By the end of the term, nobody was laughing—especially not women. In Burwell v. Hobby Lobby, the Supreme Court held, by a 5–4 vote, that the Affordable Care Act’s contraception mandate violated the religious-freedom rights of corporations. The ACA required that many employers provide comprehensive insurance—including pricey birth-control coverage—to their workers. The pill can cost upward of $25 a month, and the onetime cost of an IUD can reach $900, not including the cost of the doctor’s visit to have it inserted—sums that can be hugely consequential for most women workers. For some, these benefits can mean the difference between life and death, and they’re essential to economic parity and professional autonomy for most others. As Justice Ruth Bader Ginsburg noted in her dissent: “[T]he cost of an IUD is nearly equivalent to a month’s full-time pay for workers earning the minimum wage.” But the craft-store chain Hobby Lobby and a cabinetmaker called Conestoga Wood Specialties argued in their pleadings that providing female workers with certain birth-control devices (specifically the IUD) and morning-after pills violated the business owners’ religious convictions because these things were used to cause abortions—a claim belied by medical science and the Food and Drug Administration, but deeply felt by the corporations’ owners. In an unprecedented extension of religious freedom, the Supreme Court did two remarkable things. The majority recognized “closely held corporations”— a term left undefined in the ruling, but which, by some estimates, encompasses the vast majority of US corporations—as “persons” capable of “exercis[ing] religion.” The Court then determined that under the Religious Freedom Restoration Act, the religious rights of the employers ultimately outweigh the rights and economic needs of the women who work for them. In so doing, the Court allowed these companies, based on the asserted religious objections of their owners, to withhold basic health-insurance coverage from women. 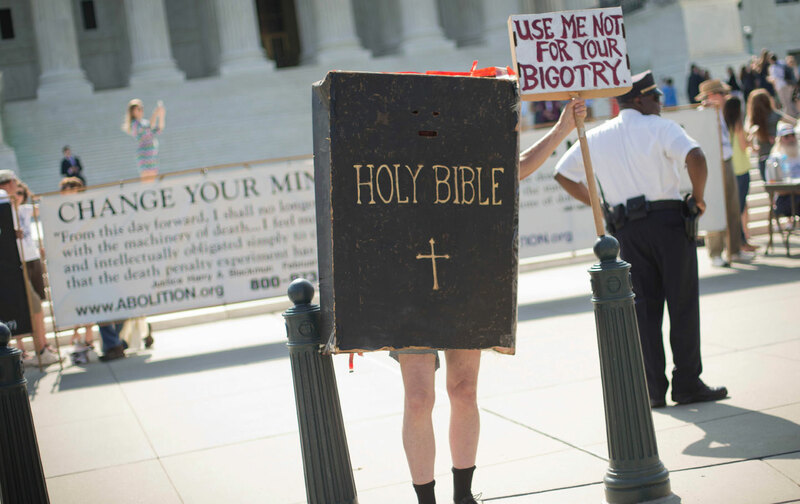 In the wake of the ‘Hobby Lobby’ ruling, cries of religious liberty have proliferated across the country. Since Hobby Lobby landed with a thump in the summer of 2014, cries of religious liberty have proliferated across the country. Civil rights are now officially on a collision course with religious liberty, and the Court primed the pump in Hobby Lobby by finding not only that corporations are more people-ish than people, and that religious convictions must always be deemed sincere, but also that the interests of third parties can be disregarded entirely. The real shock of Hobby Lobby wasn’t merely that it split the Court sharply along gender and religious lines—all five justices in the majority are Catholic men. The shock wasn’t even that the majority sidestepped the vital role played by contraception in creating basic economic equality for women, or the ways in which preventive healthcare must include access to the forms of birth control at issue. Ultimately, the shock wasn’t even that the conservative justices more or less raised man- splaining to a judicial art form by brushing away these concerns as unworthy of deep engagement. No, the underlying shock was that Hobby Lobby became part of a trifecta of cases decided that month in which women were all but invisible to the conservative majority. In McCullen v. Coakley, the Court privileged the free-speech rights of anti-choice “sidewalk counselors” over the women seeking abortions who had to run a gauntlet of abuse and threats as they entered Massachussetts health clinics. In Harris v. Quinn, the Court ruled that, when it comes to collecting union dues, home-healthcare workers—90 percent of whom are women and minorities—are considered only “partial public employees” because they work in homes as opposed to public workplaces. This fall, the Court will likely decide whether to hear one of several urgent abortion challenges, including Whole Woman’s Health v. Cole, a dispute over Texas’s draconian limits to reproductive freedom. In 2007, the last time the Court heard a major reproductive-freedom case, Justice Anthony Kennedy, memorably writing for the majority, worried that women need special protections in the reproductive-health realm because they might come to regret their bad decisions.